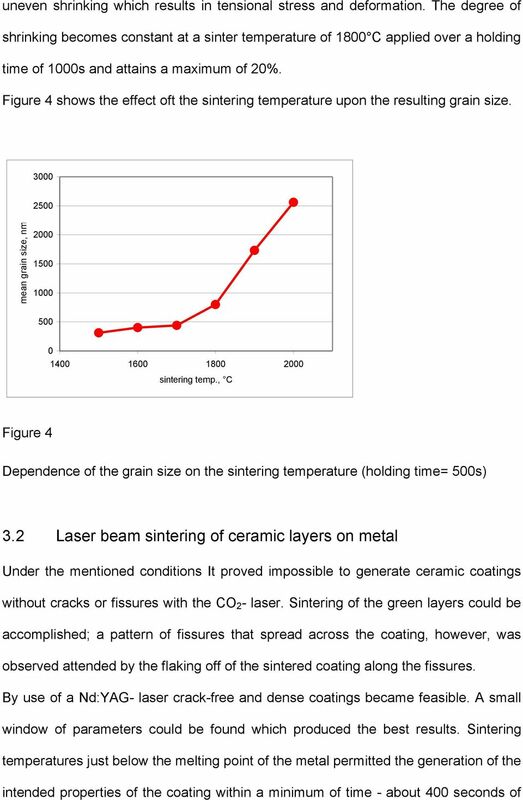 Download "Laser beam sintering of coatings and structures"
2 sintering of ceramic green bodies. Because of the laser s localized area of influence this method is qualified for the generation of a sintered body with a limited size. Thus the experiments confine to shapes with small dimensions. From assays with compact pressed alumina green bodies a fundamental overview was gained on the influences of the process parameters upon the hardness of the resulting ceramic bodies. The findings were applied to the generation of ceramic coating layers on metal surfaces. A technology was developed for the laser-sintering of powder layers of pure alumina. The layers were deposited onto steel substrates by an electrophoretic procedure, developed at the Fraunhofer IKTS Dresden as part of a joint research project. Applications can be anticipated as selective wear protection of metal surfaces. For this reason in the following experiments the hardness of the product is considered its figure of merit. Future efforts aim at the generation of non-oxide ceramic layers or shaped modules with geometries in the range of micrometers by selective laser sintering. A sinter chamber, especially developed for non-oxide ceramics and the first results achieved with this device will be presented. The presently available results verify the suitability of laser radiation for the sintering of oxide ceramics, though confined to modules or layers with sub-millimeter dimensions. Desired properties can be realised through the proper adjustment and control of the parameters during the process. The acquired qualities compare to the ones achieved by conventional sintering. Advantages of the laser sintering process are the considerably shorter process times, the option of selectivity, and the possibility to process a material or a composite under non equilibrium conditions. 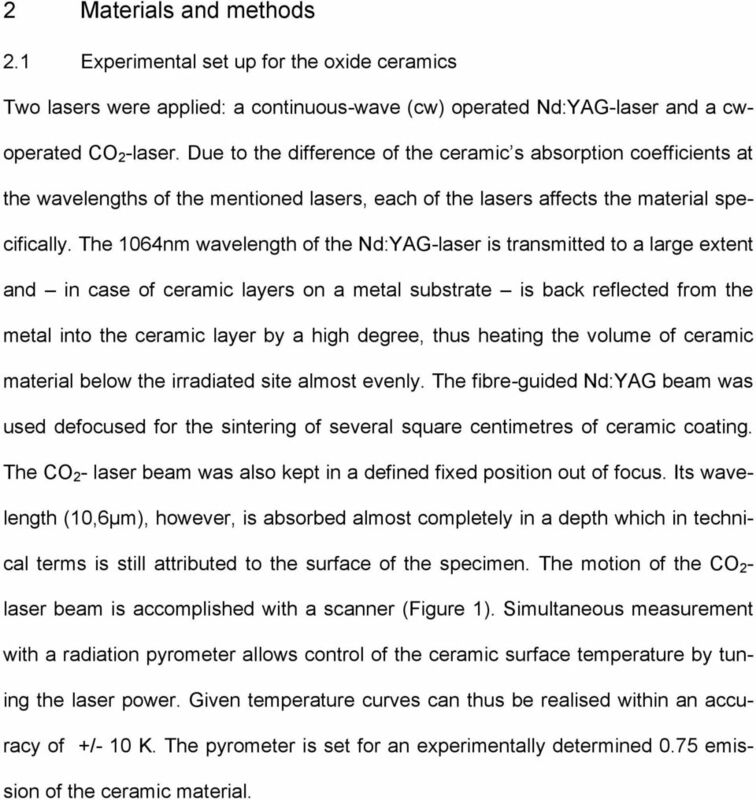 3 2 Materials and methods 2.1 Experimental set up for the oxide ceramics Two lasers were applied: a continuous-wave (cw) operated Nd:YAG-laser and a cwoperated CO 2 -laser. Due to the difference of the ceramic s absorption coefficients at the wavelengths of the mentioned lasers, each of the lasers affects the material specifically. The 1064nm wavelength of the Nd:YAG-laser is transmitted to a large extent and in case of ceramic layers on a metal substrate is back reflected from the metal into the ceramic layer by a high degree, thus heating the volume of ceramic material below the irradiated site almost evenly. The fibre-guided Nd:YAG beam was used defocused for the sintering of several square centimetres of ceramic coating. The CO 2 - laser beam was also kept in a defined fixed position out of focus. Its wavelength (10,6µm), however, is absorbed almost completely in a depth which in technical terms is still attributed to the surface of the specimen. The motion of the CO 2 - laser beam is accomplished with a scanner (Figure 1). Simultaneous measurement with a radiation pyrometer allows control of the ceramic surface temperature by tuning the laser power. Given temperature curves can thus be realised within an accuracy of +/- 10 K. The pyrometer is set for an experimentally determined 0.75 emission of the ceramic material. 4 11 Nd:YAG - Laser C 10 9 CO 2 - Laser Y X y x specimen 2 - CO2- laser beam 3 - Nd:YAG laser beam 4 - fibre with optic 5 - scanning mirror 6 - x-y-axis 7 - pyrometer 8 - mirror 9 - control unit scanner 10 - control unit x-y-axis CO 2 - laser temperature 11 - control unit Nd:YAG laser Figure 1 Experimental set-up 2.2 Sintering of compact green bodies Assays were carried out with uniaxially cold-pressed (200MPa) α-al 2 O 3 specimens with a thickness of 2.5 mm and a mean grain size of 200 nm. A CO 2 - laser beam was scanned over the surface; sinter temperature and its holding time were varied independently. 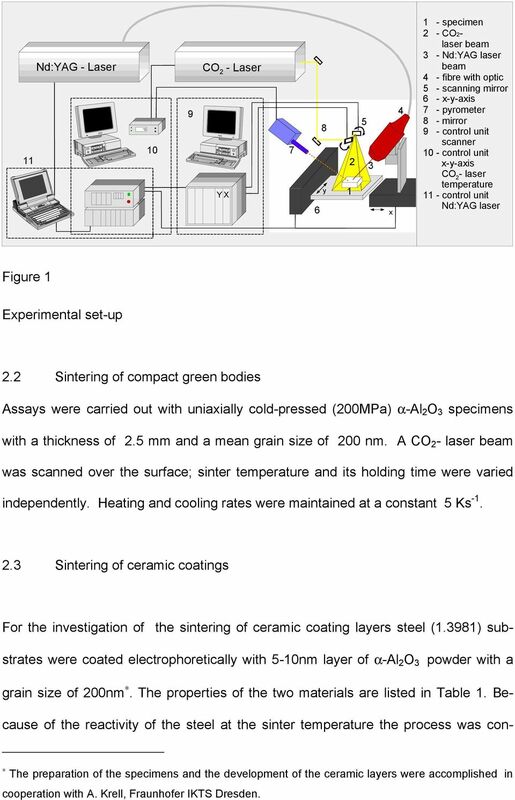 Heating and cooling rates were maintained at a constant 5 Ks Sintering of ceramic coatings For the investigation of the sintering of ceramic coating layers steel (1.3981) substrates were coated electrophoretically with 5-10nm layer of α-al 2 O 3 powder with a grain size of 200nm. The properties of the two materials are listed in Table 1. 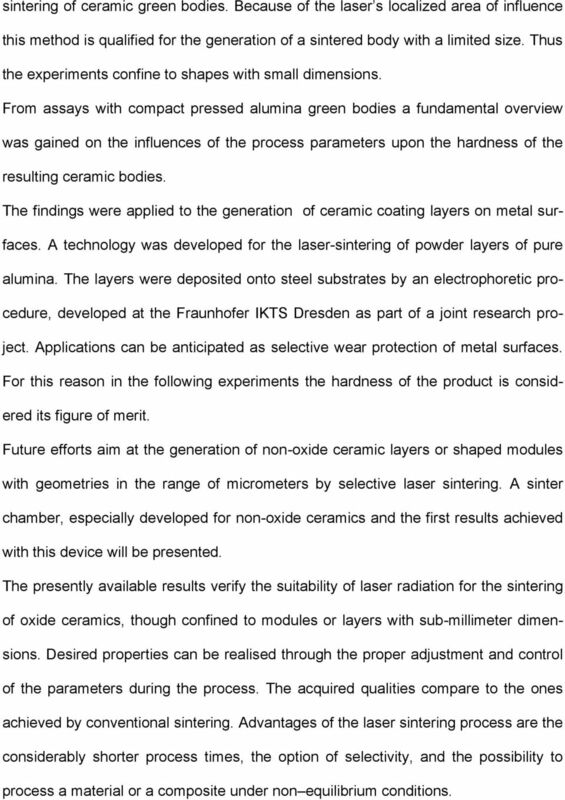 Because of the reactivity of the steel at the sinter temperature the process was con- The preparation of the specimens and the development of the ceramic layers were accomplished in cooperation with A. Krell, Fraunhofer IKTS Dresden. 5 ducted under Helium in a shielding gas chamber. 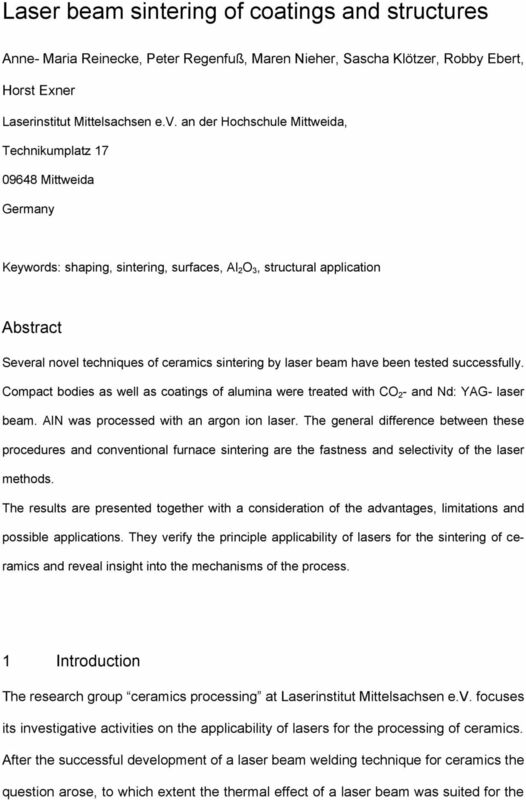 The sintering was performed with both, the CO 2 - laser and the Nd:YAG- laser. 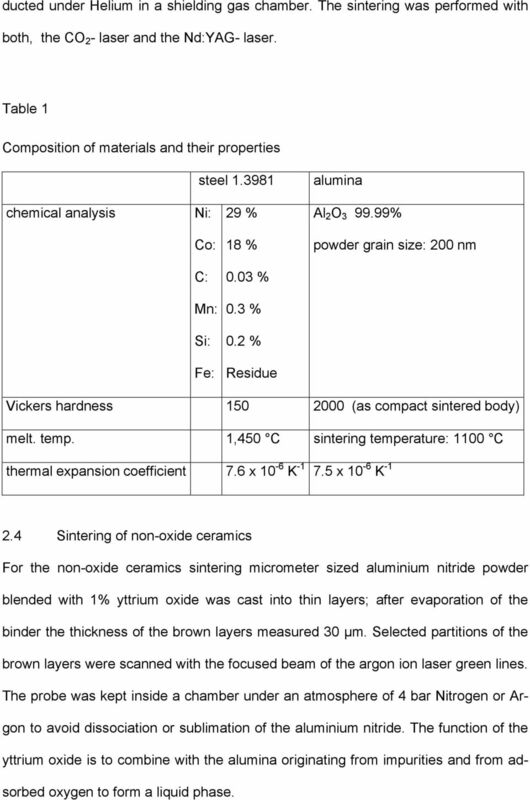 Table 1 Composition of materials and their properties steel alumina chemical analysis Ni: 29 % Al 2 O % Co: 18 % powder grain size: 200 nm C: 0.03 % Mn: 0.3 % Si: 0.2 % Fe: Residue Vickers hardness (as compact sintered body) melt. temp. 1,450 C sintering temperature: 1100 C thermal expansion coefficient 7.6 x 10-6 K x 10-6 K Sintering of non-oxide ceramics For the non-oxide ceramics sintering micrometer sized aluminium nitride powder blended with 1% yttrium oxide was cast into thin layers; after evaporation of the binder the thickness of the brown layers measured 30 µm. Selected partitions of the brown layers were scanned with the focused beam of the argon ion laser green lines. The probe was kept inside a chamber under an atmosphere of 4 bar Nitrogen or Argon to avoid dissociation or sublimation of the aluminium nitride. The function of the yttrium oxide is to combine with the alumina originating from impurities and from adsorbed oxygen to form a liquid phase. 6 2.5 Hardness measurement Hardness measurements of the compact specimen were performed by the method of Vickers with a HMV 2000 (Shimadzu) according to the standard DIN Micro-hardness measurements of the sintered coatings were carried out with a method of dynamic loading, at a load of 20 mn, a loading rate of 0.44 mn s -1 within a period of 30 s at the centre of polished cross sections. 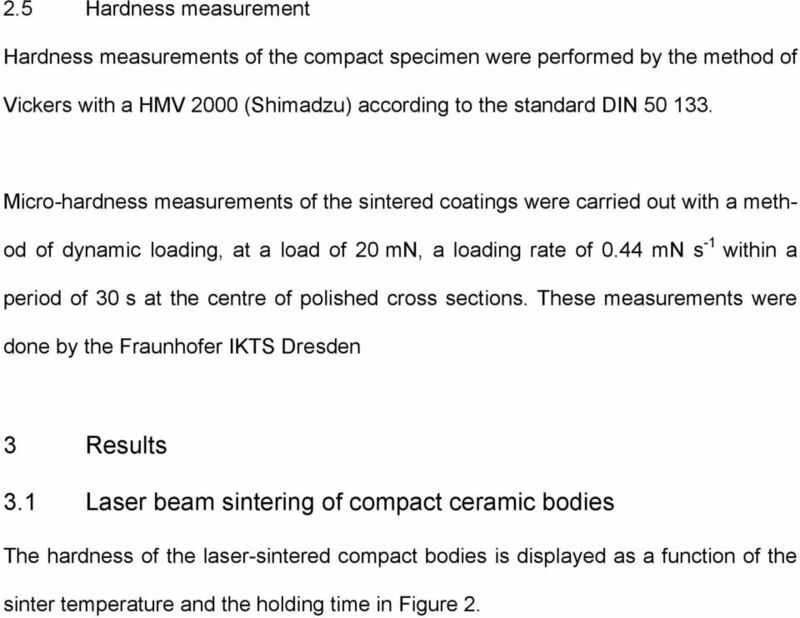 These measurements were done by the Fraunhofer IKTS Dresden 3 Results 3.1 Laser beam sintering of compact ceramic bodies The hardness of the laser-sintered compact bodies is displayed as a function of the sinter temperature and the holding time in Figure 2. 10 sintering time. Higher temperatures or a longer holding times resulted in bulk melting of the metal substrate. 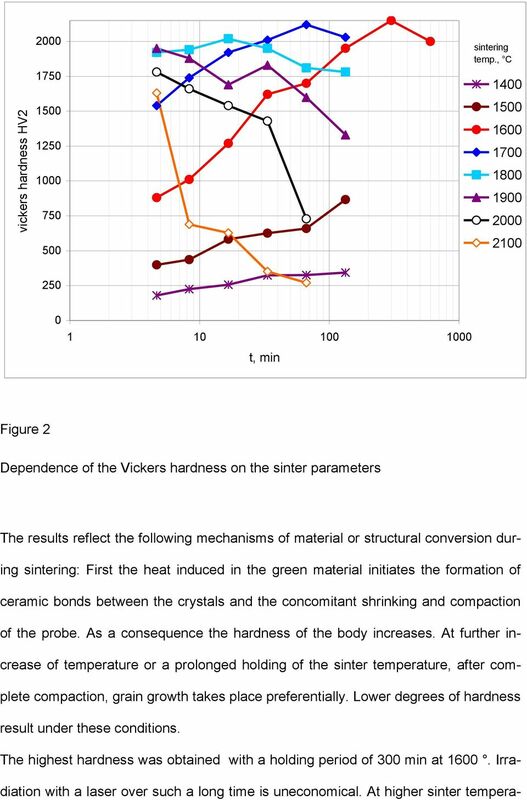 Lower temperatures required a longer holding time: At a temperature of ϑ s = 1,350 C, about 700 s of sintering time are necessary; and at a temperature of ϑ s = 1300 C, the time needed for sintering increases to more than 2000 s. The resulting coatings are characterised by: - a very fine-grained structure - high density - high adherence - no cracks at constant thickness of the layer. A predetermined grain size can be produced by the proper choice of the parameters. The minimum grain size that leads to a densely sintered coating was found to be 250 nm (The original grain size was 200 nm). Porosity was less than 6 %. Figure 5b shows the cross section of the transition zone between coating and metal. A slight density gradient can be detected rising from the ceramic-metal interface towards the laser exposed surface. The resulting hardness, up to 20 GPa, is confirmed by two different laboratories. This means that the hardness of the coatings almost equals that of compact α-alumina. 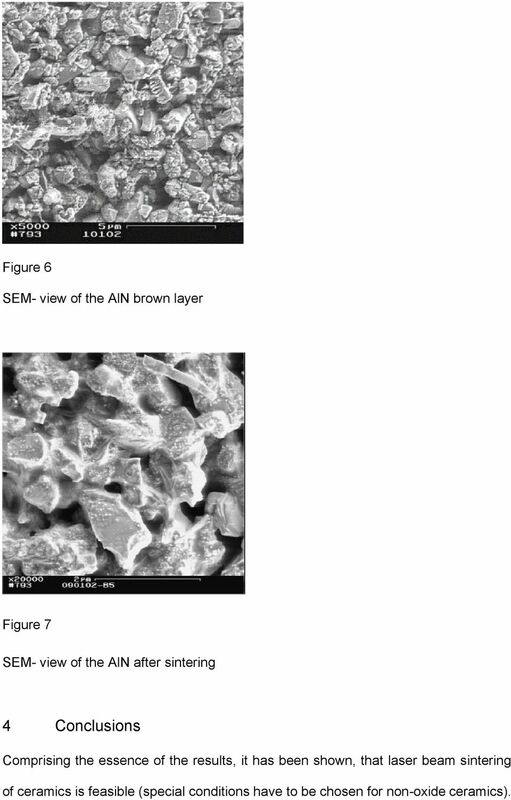 11 a) b) Figure 5 SEM view of: a) the sintered coating surface with various magnifications, b) the cross section (thickness of the unsintered coating: 10 µm) 3.3 Laser beam sintering of non-oxide ceramics Sintering of the above described brown material of AlN (1%Y 2 O 3 ) resulted in a composite consisting of AlN crystals embedded in a solidified liquid phase. The liquid phase consists mainly of Al 2 O 3 and Y 2 O 3. As can be observed from Figure 6 and Figure 7, no crystal growth took place during the process. 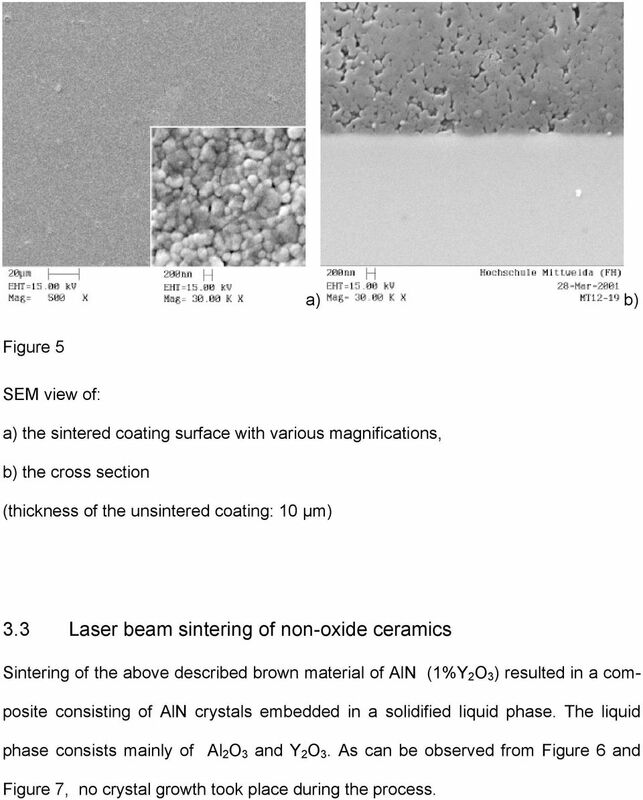 12 Figure 6 SEM- view of the AlN brown layer Figure 7 SEM- view of the AlN after sintering 4 Conclusions Comprising the essence of the results, it has been shown, that laser beam sintering of ceramics is feasible (special conditions have to be chosen for non-oxide ceramics). 13 The localized input of energy into the surface, however, causes heat gradients in the interior of the material which result in property gradients, which limit the range of applications. On the other hand this effect makes it possible to restrict the depth of the tool to defined zones at the surface of a body or at the interface of two components. Therefore its application will probably be confined to the generation or joining of ceramic layers, coatings or small ceramic bodies. Cladding with High Power Diode Lasers High power diode lasers offer significant quality and cost advantages for many cladding applications over both traditional techniques and other laser-based methods. How do single crystals differ from polycrystalline samples? Why would one go to the effort of growing a single crystal? Introduction. Keywords: Laser welding, Nd:YAG laser, AISI 316L, Ni-alloys, Thin foils. MTE 585 Oxidation of Materials Part 1 Ref. Ch. 11 in Superalloys II Ch. 8 in Khanna Ch. 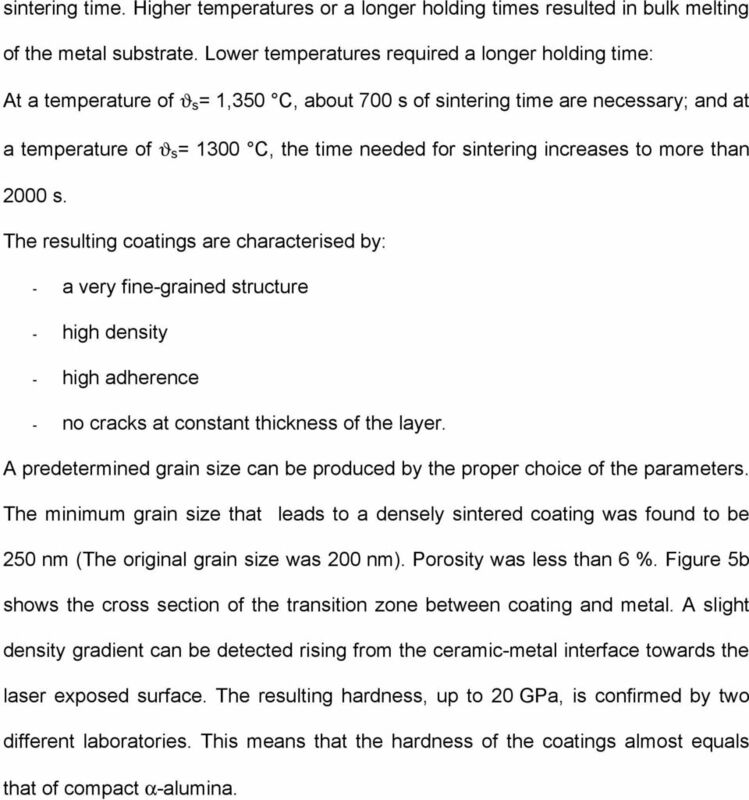 14 in Tien & Caulfield Introduction To illustrate the case of high temperature oxidation, we will use Ni-base superalloys. 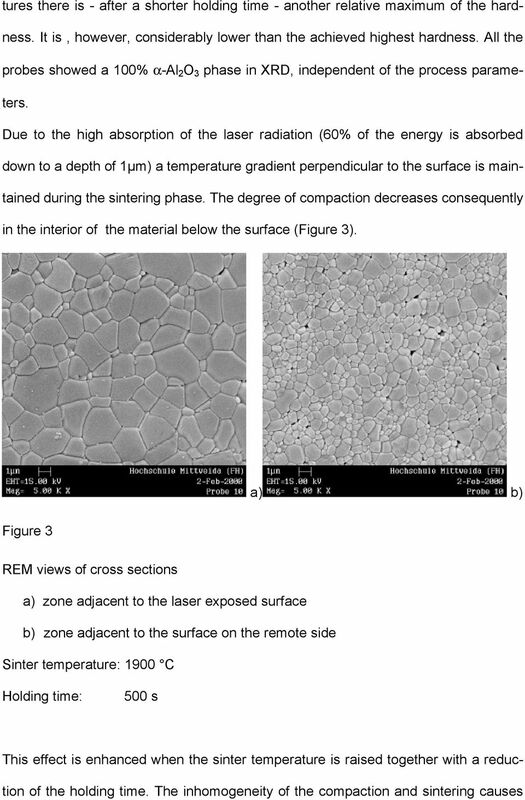 MICROSTRUCTURAL ASPECTS RELATED TO THE QUALITY OF THERMALLY SPRAYED CERAMIC COATINGS C. Zografou, G. Dhupia, W. KrÖnert, M. Protogerakis To cite this version: C. Zografou, G. Dhupia, W. KrÖnert, M. Protogerakis.